A pipe cleaner tail allows this adorable cow to be hung on any door or wall. Attach a bell around the cow's neck and you'll hear it jingle every time someone comes in. Make this easier and/or faster by cutting all the shapes ahead of time. Younger children will need help to make holes and to tie on the cow's bell. 1. Glue the small plate onto the big plate. The edge of the small plate should be around 1/2 inch from the edge of the big plate (see picture). 2. From your black construction paper, cut your "cow spots" in different shapes and sizes. Glue them onto your big plate to make the cow's body. 3. Cut out an oval from your pink construction paper the same width as your small plate. Using the same paper, trace generously around your index finger twice, to make the cow's ears, and cut out. Using the black paper, cut a 2"x2" square and then cut in half diagonally to make the cow's horns. 4. Glue all the cow's parts into place. With the black marker draw on the cow's eyes, mouth and nostrils. 5. Punch a hole in the top of the paper plate, thread pipe cleaner through hole, fold in half and curl. 6. Punch a hole in the bottom of the small plate. Using a piece of ribbon, yarn or twine, tie on a bell to the "cow's neck." 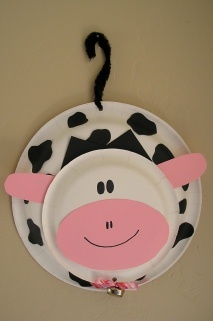 Ta-Da, all done your Cow Door Hanger, enjoy!